These films are not to be confused with those of a neighboring genre, the Women in Danger films, which spew hatred of women. Sleazoid movies seem to exist on the edge of self-parody, and their ambition is to be to the cinema what the geek show is to the circus. They're not antiwoman, they're antitaste, and their characters sink into moronic, bestial savagery. They touch on the ultimate horror of people degraded into subhuman, animalistic behavior. Some of these films, I should add, are not without merit -- although this isn't the place to launch into a defense of them. What Motel Hell brings to this genre is the refreshing sound of laughter. This movie is disgusting, of course; it's impossible to satirize this material, I imagine, without presenting the subject matter you're satirizing. But Motel Hell is not nearly as gruesome as the films it satirizes, and it finds the right stylistic note for its central characters, who are simple, cheerful, smiling, earnest, and resourceful cannibals. Motel Hell (the second "e" on the neon sign has gone out) is a ramshackle place that seems to be located in the same redneck backwoods where Russ Meyer's characters all live. It is operated by friendly Farmer Vincent (Rory Calhoun) and his sister (Nancy Parsons). The district is patrolled, none too adroitly, by a relative (Paul Linke), who is the sheriff, but sees nothing wrong with burying the victims of a motorcycle crash without benefit of investigation or autopsy. That's just as well, because Farmer Vincent's specialty is burying people. He just doesn't wait until they're dead. He waylays unsuspecting travelers, knocks them unconscious, buries them up to their necks in his secret garden, fattens them up with cattle feed, and then slaughters them, smokes them in his smokehouse, and sells them as sausage at his roadside stand. His cheerful motto: "It takes all kinds of critters ... to make Farmer Vincent's fritters." All right now, of course this is disgusting. But hold on just a dagbone minute, as Farmer Vincent might say. It isn't simply the subject matter of Sleazoid Movies that makes them reprehensible, it's their low opinion of human nature, their acquiescence in the proposition that the world is essentially an evil place. 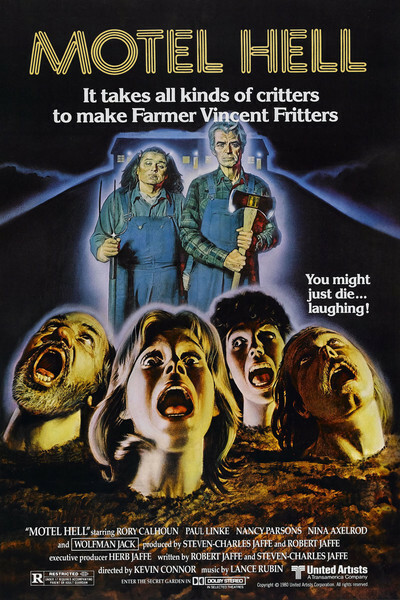 Motel Hell, with Rory Calhoun looking like a Norman Rockwell model in his bib overalls, pushes this material so far in such unlikely directions that, incredibly, it works as satire. A lot of horror movies used to work that way. We went to be scared, sure, but we also went to laugh, enjoying the delicious self-indulgence with which Vincent Price or Christopher Lee hammed it up. But horror movies stopped being funny. And now they're mostly just depressing, disgusting exercises in depravity. Motel Hell is a welcome change-of-pace; it's to "The Texas Chainsaw Massacre" as "Airplane!" is to "Airport." It has some great moments, including a duel fought with chainsaws, a hero swinging to the rescue on a meathook, and Farmer Vincent's dying confession of the shameful secret that he concealed for years. These moments illuminate the movie's basic and not very profound insight, which is that most of the sleazoids would be a lot more fun if they didn't take themselves with such gruesome solemnity.